Love Is the Problem Mark's song for all you single folks out there. The Last One Matt's anthem about recrimination. Lost the World Mark's song about life after failure. Kite Matt's song about taking someone for granted. New People Mark's song about being shy. Down So Low Matt's song about working (Mark helped out with the words). Luge Mark's song about something or other. Thanks for Stopping By Matt's song about commiseration. Horse Mark's song about getting yet another band together. Another Way to Fall Matt's song about daily coping. The Easy Thing Mark's song about singing for the ladies. Shadows Fall Matt's song about finally getting it together. Axiomatic Mark's song about pessimism. No, this is not the band playing, but just a cheesy iMovie thing that Mark put together for Love Is the Problem, which you may find amusing. More video, including live footage from our 9/28 appearance at The Frequency. Sunday, September 28, 8pm at The Frequency : 121 W Main St, Madison, WI. With the fabulous Blamm-O starting things off and the new-original Bar Code playing cool stuff after us to finish off the night. For bookings or to get on the mailing list to be alerted of future shows, please contact mark@marklint.com and mmattacker@aol.com. 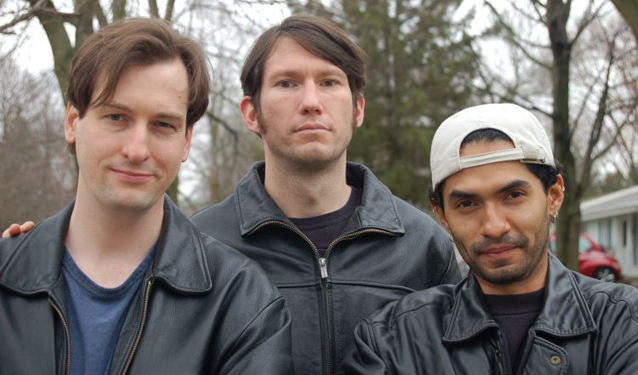 The band is Matt Ackerman and Mark Lint, playing guitar and bass respectively and splitting the singing songwriting duties, and Julian Salgado Laredo playing drums. Mark's fronted lots of bands, including most recently Madison Lint. Matt currently plays with Blamm-O and used to play in Doll and the Sun Dogs, among others. Julian moved to Madison from Mexico in August, 2006. What kind of music do we play? Oh, just listen to the above sound-files. We're aiming for direct rock/pop here with nice harmonies over a sort of a grunge base, but we've got wide tastes, and the music will inevitably reflect that. Where do we play? New People have been playing shows in the Madison area since Spring, 2006, mostly at Glass Nickel Pizza, and also at the Club Tavern in Middleton. Previous show: Saturday, May 3rd, 9pm at Glass Nickel Pizza, Madison East: 2916 Atwood Ave with the fabulous Optometri. If you want to hear and read more about the ramp-up for this band, check this page.